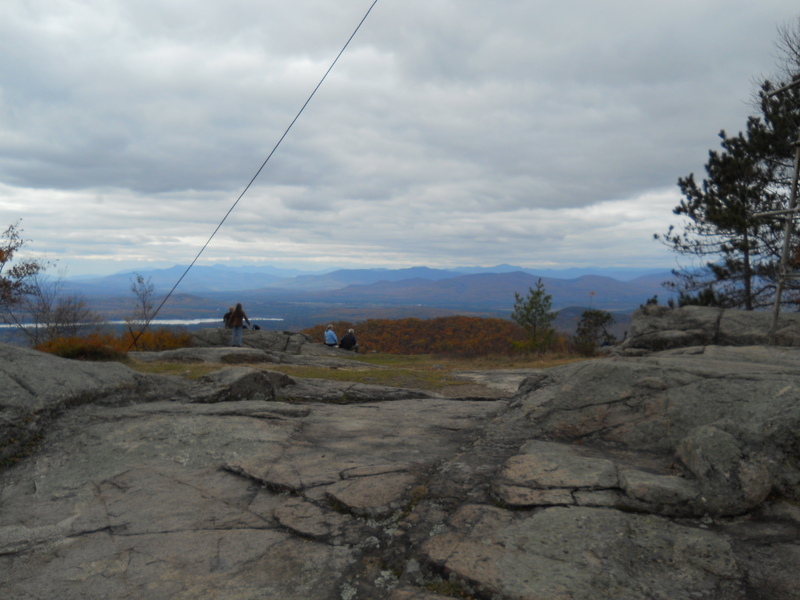 Pleasant Mountain; Bridgton, ME - Take a day trip! View from atop Pleasant Mountain in Bridgton, ME. 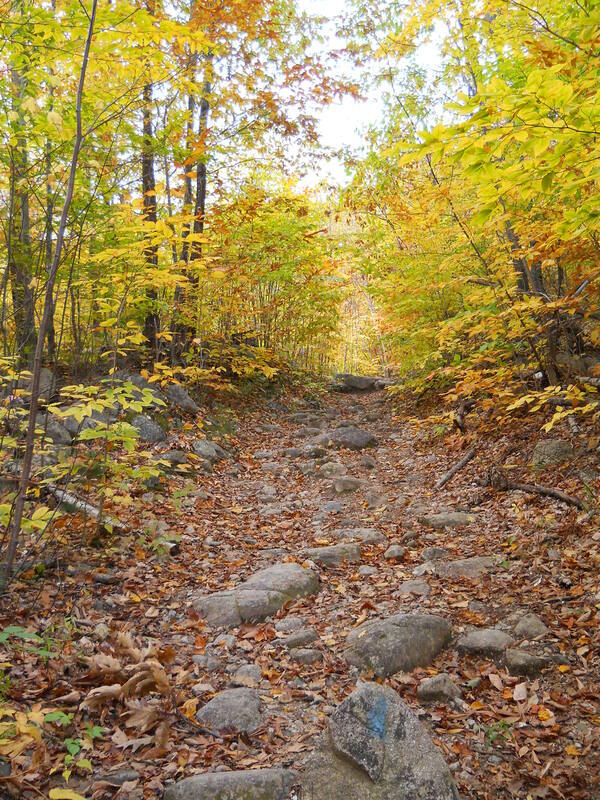 Hiking: Pleasant Mountain has a extensive trail network with over 10 miles of trails that give you multiple routes to the summit. 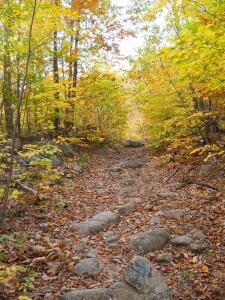 Trail with fall foliage at Pleasant Mountain in Bridgton, Maine. Snowmobiling: Snowmobiles are allowed on the Fire Wardens Trail only. All other motorized vehicles are prohibited on the reservation. Downhill Skiing and Snowboarding: Pleasant Mountain is also home to a ski resort; Shawnee Peak. For more information including a trail map and ski conditions please go the resort’s website. Swimming: Swimming is allowed at nearby Moose Lake and Shawnee Peak Ski Area maintains a swimming area for summer use. Hunting: Hunting is permitted on Loon Echo Land Trust property in season and with a Maine State License. Hunting isn’t allowed on the private property adjoining the property without express permission of the landowners. Mountain Biking: I saw nothing on my visit there that mountain biking is banned, however not all trails are ideal for it as many of them are rocky winding paths in spots. The Fire Wardens trail is probably your best best to bike to the summit. Birdwatching: The diverse habitat at Pleasant Mountain is home to many bird species and a great place to bring a pair of binoculars and watch them! Dog Friendly: Dogs are permitted at Pleasant Mountain and is a very popular location to bring them along on a hike, however the owners of the reservation requests that you be careful to keep your dog under control. Camping: Camping isn’t permitted on any of the Loon Echo Land Trust Property or the land owned by the state of Maine or the private landowners. 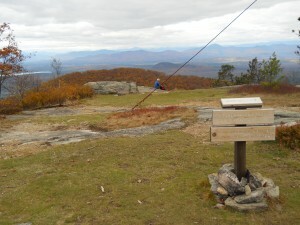 However, Shawnee Peak maintains a yurt that can be reserved for a unique camping experience. For more information please go to Shawnee Peak’s Website. 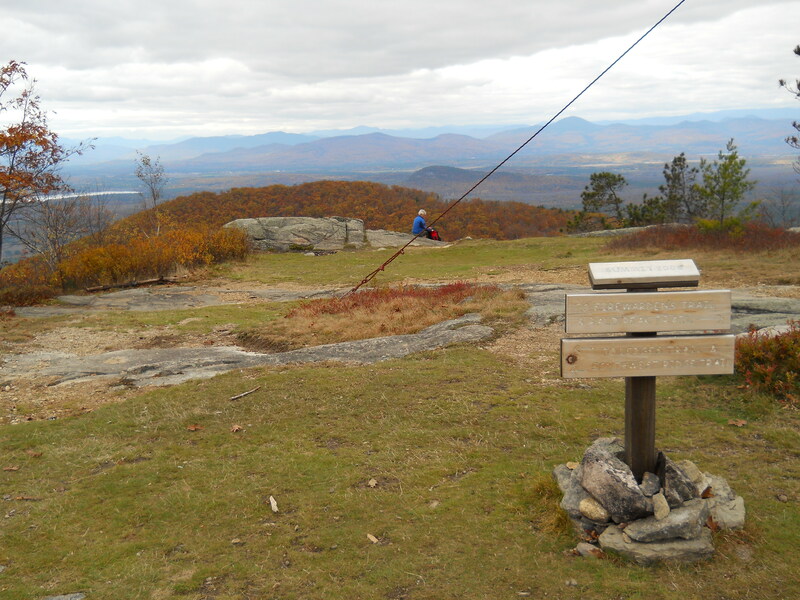 Favorite Activities: Pleasant Mountain is a great place to hike and views at the top are amazing. Combined with the amazing foliage in Northern New England if you time it right and you have the ingredients for a memorable day or weekend. 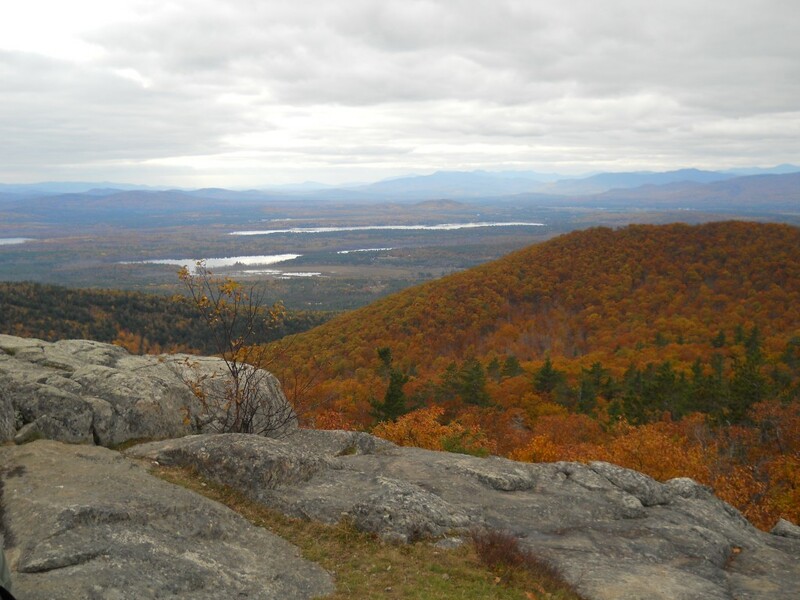 Fall foliage of Maine from Pleasant Mountain in Bridgton, Maine. Facilities, Fees and other information: There aren’t any facilities beyond what is open at the ski resort base area (which isn’t on the hiking trail network). Parking and use is free for day visitors. The Shawnee Peak Resort base area has complete facilities including lodging.